Master Thatcher Grant Batchelor recently appeared at the National Homebuilding & Renovating show. The show, which was held at the NEC, Birmingham, saw Grant demonstrating his craft on a stand organised by the Heritage Skills HUB. 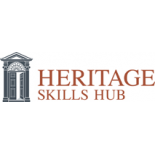 Heritage Skills HUB is a not-for-profit Community Interest Company, set up to promote and support traditional building skills to all those who care for traditional buildings. Thatching Advisory Services recently attended the National Society of Master Thatchers Annual Conference and AGM. Rob and Gary from TAS attended the event on Saturday 16th March. The conference, which was once again held at the Burley Manor Hotel in Hampshire, was very well attended and included some excellent presentations including a seminar on the Thatchmark programme as well as the presentation of the President’s Cup for most improved apprentice and the awards for the Best Thatched House Competition. TAS recently attended the National Society of Master Thatchers Annual Conference and AGM. The event, which was held at the Burley Hotel in Hampshire, was very well attended and included some excellent presentations. The conference was a great opportunity to catch up with old friends and colleagues as well as meeting new ones. It was also a chance to obtain a copy of Marjorie and Roger’s new book Thatches and Thatching. 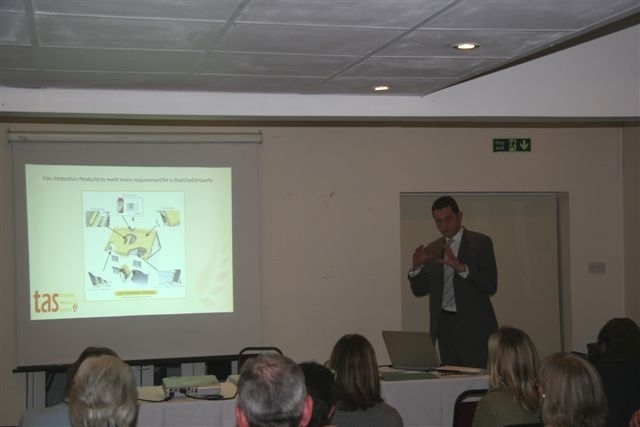 Rob Norcott recently gave a presentation to a number of NFU policy holders in Hungerford, Bekshire. The presentation explained the various fire protection products and systems available to the owners of thatched properties. The event, which was organised by the Hungerford NFU Mutual branch office, saw Rob attend in a support capacity alongside the NFU Mutual thatched property insurance representatives.